This tells a simple story. 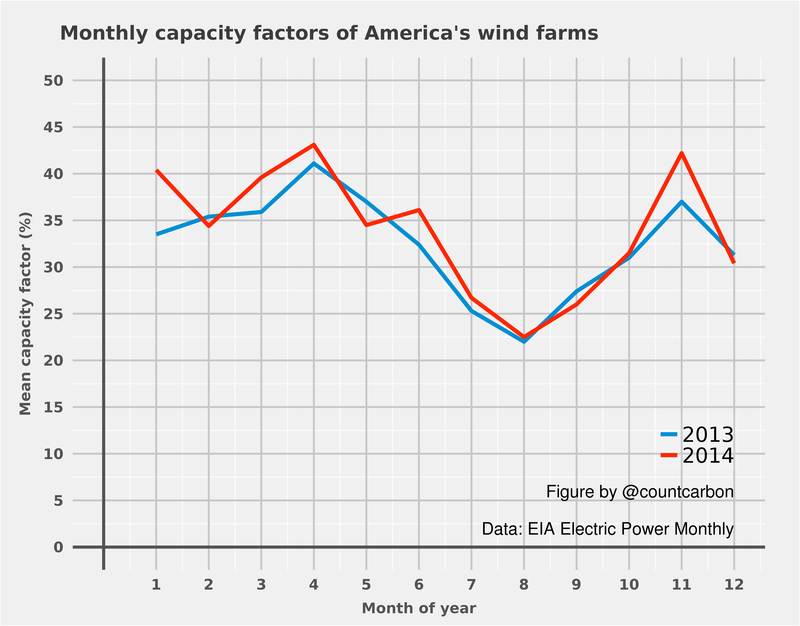 The average capacity factor of America’s wind farms is very higher, much higher than most other countries. However, to imagine this is the same throughout America would be a mistake. The climate in California is rather different to that in North Dakota or Texas. And wind farm output follows a very different pattern. 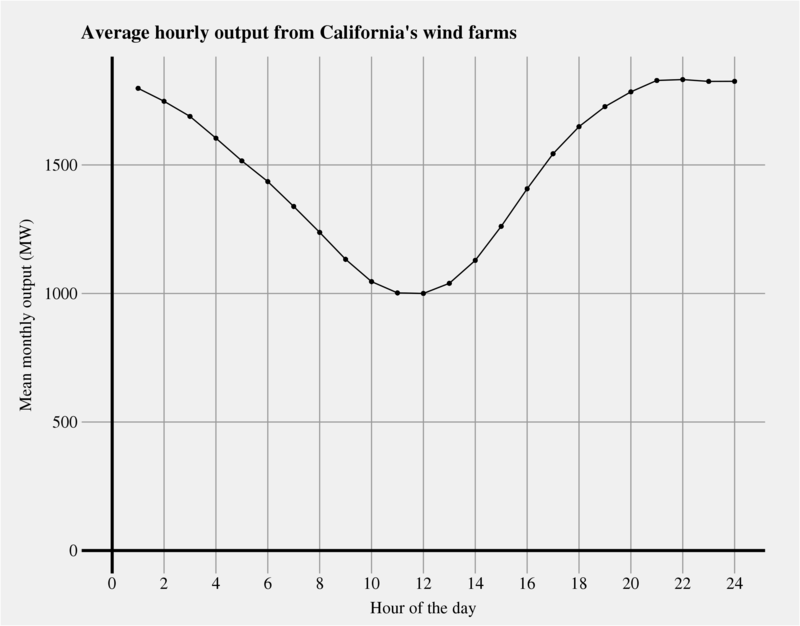 We can find out how much wind farm output varies in California by looking at the hourly data provided by CAISO. Let’s look at it from a number of angles. 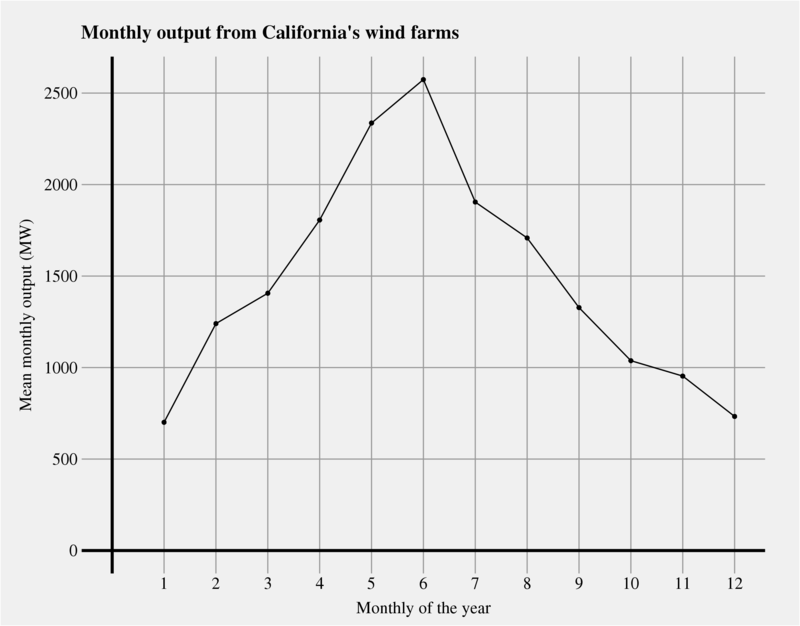 Put simply, California’s wind farm output essentially falls to zero on a relatively frequent basis. In 2014, California’s wind farms had a mean output of 1191 MW. According to CAISO, the minimum output was actually 3 MW on 2nd January. This was 0.25% of mean output and 0.07% of maximum output in 2014. As you can see the daily low frequently goes towards zero. Most problematically, it goes towards zero in December and January. This is when California’s solar output is also at its lowest point. Winter equals less sun and less wind in California. Another way of looking at this is daily means. These arguably provide a better picture of seasonal variation than daily lows. Lows may occur at night when demand is lowest, thought they mostly don’t. However, if there is no electricity from wind farms all day then we are in trouble. Here are the daily means on every day in 2014. Again, the seasonality is pronounced. In July and August the daily mean is more or less never below 1000 MW; whereas in December and January it is rarely above 1000 MW. Pronounced lulls are also striking. The first ten days of December and the middle of January saw week long lulls where wind farm output is consistently below 10% of the annual mean output. The graphs above show large seasonal variation. But how much does this vary? Below is a graph of mean monthly output in 2014. Monthly variations in output are clearly massive. The best month was June where the mean output was 2573 MW. The worst was January, which had a mean output of 733 MW. The best month therefore saw output 3.7 times greater than the worst month. Wind farm output typically follows some kind of daily cycle (on average). And California’s is relatively pronounced. Ideally, the daily and seasonal cycle will follow the cycle of electricity demand as possible. But clearly California’s does not. Wind farm output peaks at midnight when demand is relatively low. On the other hand demand peaks in summer when wind farm output is also relatively high and relatively consistent. However, these comments are getting rather close to hand waving. 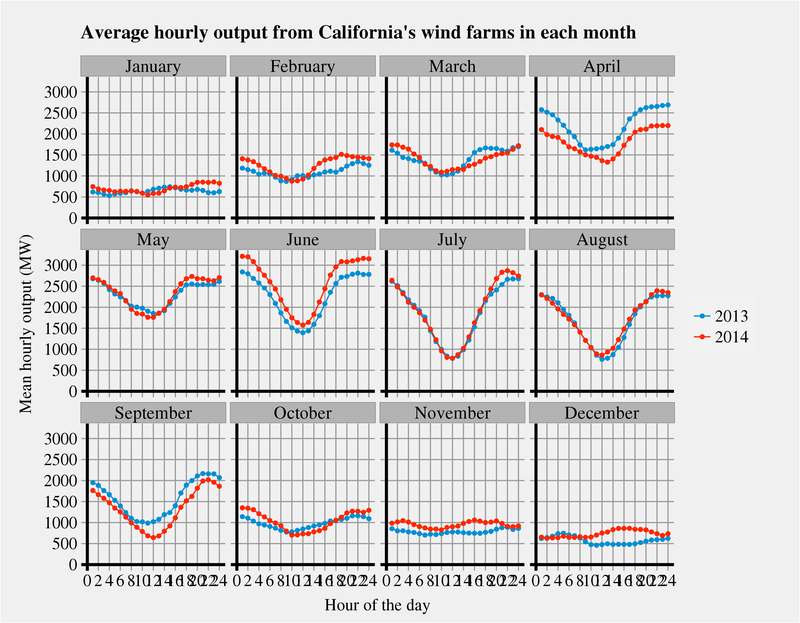 So if I find time I will try to write a blog post showing a simple model of curtailment of renewable electricity in California, and how this is related to the interaction between seasonal electricity demand and season renewables production. 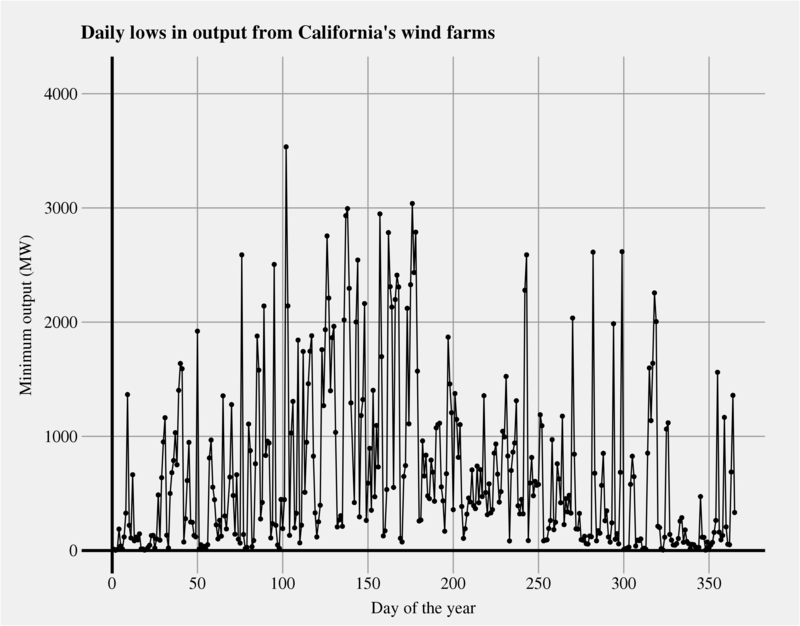 Wind farm data was downloaded from the CAISO website and processed in R and plotted using a custom theme in ggplot2. I will be posting the code used for these plots in a later blog post. Previously I included code below the posts, but this is probably a distraction for many. So, in a separate post code will now be shoved. hypergeometric in the comments asked about the correlation between wind and solar output. Roughly speaking, wind and solar have similar(ish) seasonal cycles. Both see peaks in summer, and minimums in winter. The year round average seasonal cycle for wind is also the opposite of that for solar. Solar peaks at mid-day however, while wind hits its minimum. However, the daily cycle for for wind is not consistent year round. And it flattens out a lot in winter. Is renewable energy growing quickly enough for Britain to meet its renewable energy targets? That’s an interesting article. I’ve just written a start about Renewables, with some comment on the UK and wind power and the need for backup generation. (One of our commenters recommended your site). Do you know the installed cost of the wind power in California? It would be an interesting datapoint for the 1.2GW production. Also, do you know the geographical spread of the wind turbines – are they evenly distributed throughout the state? Those questions would merit a blog post, not a response in the comments section. We are having a major heat wave in Northern CA once again! Boy it’s been HOT (104F at about 1pm), and a tad humid as a high pressure ridge is positioned to pull some of the moisture from the Baja area around the western side of the Sierra’s and back into my neck of the woods. I am sure this atmospheric event is paying havoc with the output of the concentrating solar facilities down south. It’s no wonder CASIO doesn’t have tours around this time of year given all the variability they are having to deal with. The output of the wind farms east of the Bay Area drop off when high pressure ridge(s) cut off the Delta Breeze. Thanks for all the data on wind generation in CA. I have been trying to make sense of a few reports and I was in need of some wind data. Please try to give your comments more shape. Any idea of what the time-varying cross-correlation between wind output and solar output for California looks like? I haven’t seen this worked out. That would be tricky to work out. The daily cycle for wind shown above has wind output peaking around mid-day, which is exactly when solar peaks. But the wind cycle varies a lot during the year and flattens out in winter. I’ve added an additional graph to the post to show this. 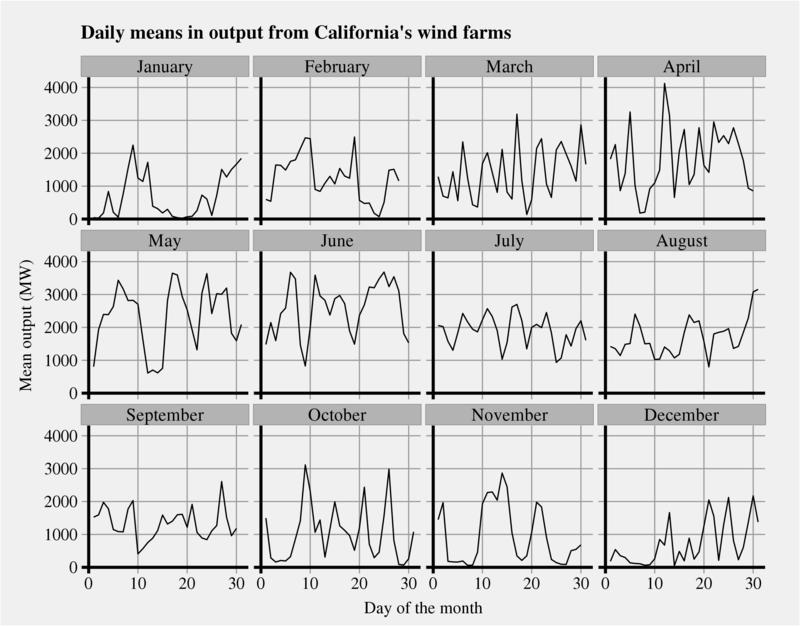 But roughly speaking, the daily cycles of wind and solar in California complement each other. Though to figure out the exact extent of this you would need to look at load cycles etc. Actually, a little scholarship shows it’s already been done. See https://goo.gl/hAUD3o for the figure. This is from http://www.nerc.com/files/IVGTF_Report_041609.pdf. Also, the implications of this and large-scale build-out of renewables has been looked at, not only for California, as in http://goo.gl/Nu8TiX, but also for the East Coast, as in http://goo.gl/gpLFqR. Apparently it’s a question of spatial scales that renewable systems get integrated across. The upshot seems to be that with smart day-ahead forecasting and small amounts of on-demand gas-to-electricity to fill in where things absolutely fall short, this looks workable. The idea is to overbuild both solar-with-storage and wind so load can be met with but 1-\epsilon of the installed base, where \epsilon is a function of forecast accuracy. Why were you asking me the question if you already knew the answer? And these references don’t appear to do what you asked about. I assumed you were talking some form of technical time series analysis of cross correlations. i did not know the answer. I thought you might. When you replied “Nay”, I went lookin’. Clearly, I (or anyone) want the result of a technical cross-correlation. But the anti-correlation between wind and solar — at least for Carlifornia — is so clear cut, it’s not needed.